Last year, VAHS founder Colin Rochester and voluntary sector researcher Meta Zimmeck wrote a review of 2011, suggesting hard times might prompt a return to core values. For our January feature they review 2012 and recall a timely yet forgotten report from twenty years ago. It has been another grim year for many voluntary organisations and the people they exist to serve. Cuts to public services – especially at local government level – are ever deeper. The Coalition is now slashing social security payments – which it and its supporters in the right-wing press have relabelled ‘welfare’ – as in the US – to make sure we don’t treat any such payments as rights but see them as handouts to unworthy ‘scroungers’. The real agenda behind the NHS ‘reforms’ has become clearer as services and facilities are auctioned off to corporate interests and as financial stringency has driven ‘rationing’ and relabelled some of the most needy as ‘health scroungers’, who have already had their ‘fair share’ or on whom treatment would be ‘wasted’. The funding available to voluntary organisations continues to fall at the same time as the needs of their users become ever more pressing. And, after a century of delivery as a public service, libraries are being returned to their philanthropic roots – although there is precious little sign of a new generation of people like Carnegie and Passmore Edwards coming forward to support them. Meanwhile the only real growth area for voluntary action seems to be the provision of food banks for people who cannot afford the basics of life. Opposition to these attacks on the living standards of the poor has been strangely muted: the voluntary sector has said little. A recent article in the Guardian has criticised the big national children’s charities for their silence and attributed it to their unwillingness to criticise a government that provides much of the funding for the services they provide. And this seems to be the path followed by too much of the sector. Maybe it is time to revisit the 1993 CENTRIS report published by the Home Office in 1993, which was more or less disowned by its publishers because of the voluntary sector establishment’s considerable opposition to its main conclusions. The focus of its ire was the argument advanced by the author, Barry Knight, that the sector yoked together two very different kinds of beast – on the one hand ‘the first force … authentic voluntary action, prophetic, vision led, reformist, independent of government’ and, on the other, ‘the third force … part of the wider social economy. It acts philanthropically on sub-contract from the state’ which ‘oversees performance and pays for work done’. ‘It was unrealistic’ he argued ‘to combine these types of action in a single organisation’. The claims of Knight’s critics that their organisations could combine both roles because providing services gave them the authority to criticise government and informed their lobbying activities rings even less true today than it did in 1993. Twenty years or so on, the element of voluntary action that Knight termed the ‘third force’ has been well and truly mainstreamed into a position near the centre of the policy stage. In the process it has not only abandoned any pretensions to ‘speak truth to power’ but in the pursuit of public sector contracts has become an active promoter of the agenda of the government of the day. The so-called infrastructure bodies that assert their leadership of the voluntary sector work hand in glove with the Coalition and their commercial allies. From its fortress in the bigger and better Society Building, NCVO has been in negotiation with SERCO, an organisation with a very dubious reputation from its work for the justice system and the detention of asylum seekers, to develop a code of conduct to regulate the relationship between the corporate bodies that are the main beneficiaries of the current commissioning regime and the voluntary agencies to which they sub-contract some of the work. The leader of ACEVO, the chief executives’ trade union, has chaired the government’s sub-group on ‘Choice and Competition’ that formed part of its rejoinder to criticism of its proposals to throw the NHS open to market forces. As the government’s welfare reforms take effect we know that some of the most vulnerable people in the country will be affected – including children. Our sector will be at the frontline – helping individuals and families prepare for and manage change. We therefore ask Ministers to give special consideration to the important work that our sector … can play in relation to welfare reforms and preparing for their impact. The National Coalition for Independent Action has challenged these self-appointed leaders’ right to speak for the sector as a whole and has pointed to the opposition of many voluntary organisations and groups to the government’s ‘reforms’, which it believes are better seen as ‘cuts’. It believes that the proper role of voluntary action is to oppose measures that will adversely affect many of those people that voluntary organisations exist to serve rather than to contribute to the implementation of policies of this kind. Unfortunately, it might well be the case that the views expressed by the sector’s ‘leaders’ command support among the ‘third force’ majority of voluntary agencies, although it is difficult to know this due the deafening silence at the grassroots and the lack of measures for ascertaining the views of the sector generally. At the same time the opportunities for the expression of dissent and disagreement within the sector are decreasing as it undergoes continuing ‘consolidation’ and ‘rationalisation’. This has two facets. In the first place, national organisations are increasingly asserting control over local groups that used to exercise autonomy in deciding how to spend the funds they raised locally. At least one group of local trustees of an Alzheimer’s Disease Society has reacted to the takeover of their branch by setting up a rival organisation to continue its work. In the second place, organisations are increasingly looking to merger as a way of dealing with the worsening funding climate. The latest example is the takeover of Volunteering England by NCVO. VE is the descendant of the Volunteer Centre UK, which was set up in 1973 following the recommendation of a committee on the voluntary worker in the social services chaired by Geraldine Aves. Her committee reviewed a number of possible hosts for a new organisational focus for volunteering, including NCVO, but came down firmly on the side of a free-standing single-purpose body. After nearly forty years that vision has come to an inglorious end as VE’s trustees concluded that the organisation had no future now that it has lost its funding from central government. 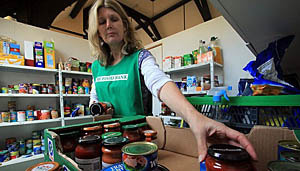 It’s been a grim year for voluntary action and the outlook is no brighter. Can the flickering embers of Barry Knight’s ‘first force’, which after all constitutes the vast majority of the sector, be fanned back into life? Or have the ‘third force’ nonprofit businesses established an unshakeable grip on the voluntary sector? Ralf Dahrendorf once memorably described the sector as ‘anarchic’ and said that it was all the better for being so. Is that the echo of a now vanished age or will the disruptive elements reassert themselves? B. Knight (1993). Voluntary Action. London, Home Office. G. Aves (1969). The Voluntary Worker in the Social Services. London, National Institute for Social Work Training/National Council for Social Service. This entry was posted in Colin Rochester & Meta Zimmeck, Features, Politics, Review of the Year and tagged campaigning, children, consumerism, David Cameron, health, philanthropy, private sector, voluntary sector. Bookmark the permalink. Not only the americanism of ‘welfare’ but the ConDems coupling of the term with ‘reform’ giving the impression that something’s being improved. An apt, and timely article. National Coalition for Independent Action (NCIA) has for years been fighting a losing battle against the take-over of the Voluntary Sector by whatever government happens to be in power, to the degree that the VC has become little more than an arm of the state – conclusively underlined by the now infamous letter from magnificent 14.